2, the diameter of the steel ball of 16mm. Application in the determination of soft polyurethane foam falling ball rebound performance. Falling ball rebound is through a ball given diameter and quality in a specified height free fall in the foam specimen, and calculate the ball rebound the maximum height and the ball falling height ratio of the percentage of both spring rate, said resilience foam to rebound rate. Meet the 08 Standard A method and B method test method. It is mainly to test the rebound performance of plastic foam material and sponge material. Drop ball rebound measurement accuracy using microprocessor control, Chinese display, and can print test data. 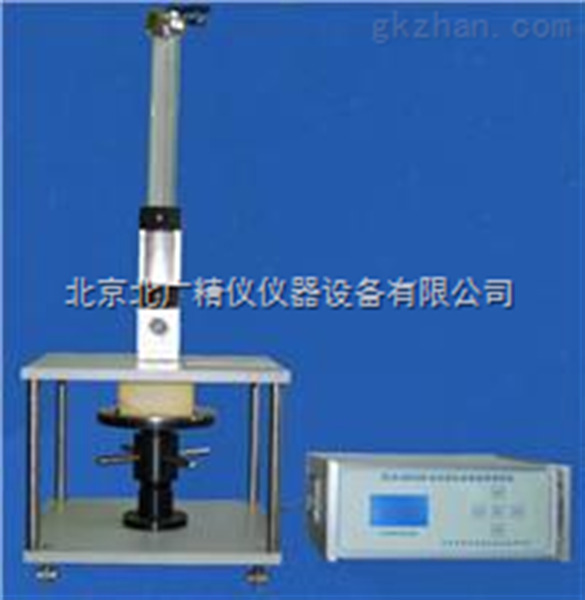 The adjusted sample level is placed on the test position of the spring back gauge, and the height of the bottom of the steel ball from the fixed position to the foam plastic surface is 460mm. Fix the steel ball on the release device, and then make the ball free fall. For each of the samples to do three times the rebound, take the maximum value of the three rebound. Each spring steel ball should fall on the same position of the sample surface, and the time interval of the two rebound should be controlled within 20s. If the steel ball in the rebound in the process of encounter or pop-up measurement device, the data is invalid, need to re do. Copyright © 2017 北京北广精仪仪器设备有限公司 All Rights Reserved.